Individuals with autism spectrum disorder often have trouble communicating with others. They may look away when someone is speaking to them, or react with laughter in a serious situation. These children often have problems with motor control, eye-gaze attention and emotional facial expressions, and in early age, these deficits may lead to other social deficits, such as delayed development of social cognition. To improve these important social skills, researchers at the University of Denver are investigating whether robots can help autistic children have more meaningful human interactions. A team at the Daniel Felix Ritchie School of Engineering and Computer Science is conducting a pilot study with human-like robots and high-functioning autistic children ages 7 to 17. The study participants have 30-minute sessions every two weeks with a robot called NAO (pronounced “now”). NAO is a multifunctional humanoid that can speak, walk and even dance. It’s also programmed with facial and voice recognition capabilities. So why use robots and not people? The researchers believe robots can trigger social responses in autistic children more effectively than people can. Plus, toys are often more approachable than people for children with autism spectrum disorder. “Our robot looks a lot like a human but doesn’t have all the features that a person does. That can help autistic individuals because the robot is simpler. They can focus on one social aspect of communication at a time,” said Mohammad Mahoor, associate professor of electrical and computer engineering, in an interview. That's because NAO can be customized to have a limited range of gestures and behaviors. The researchers are using NAO to measure gaze responses, facial expression recognition and imitation in both autistic individuals and a control group. NAO is equipped with four microphones and two cameras to record essential data about each study participant, including the duration and frequency of the person's direct gaze and range of expressions. When participants complete a task successfully, NAO rewards them with a celebratory high-five. 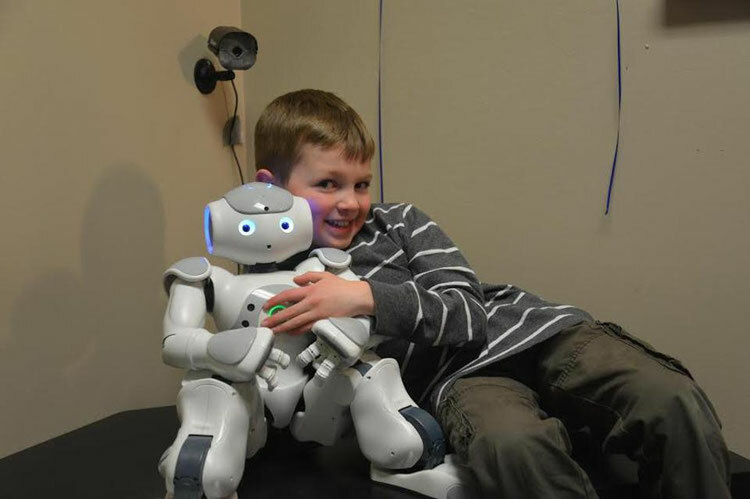 “We’ve seen that autistic children really love to interact with the robots. At first there’s a little bit of a surprise, but then you eventually see a great bond between the kids and the robots,” said Mahoor, who is an expert in visual pattern recognition, social robot design and bioengineering. Mahoor and his interdisciplinary research team have built two games for face-to-face interaction with NAO to teach participants how to replicate human social behavior. One of the games uses several small beanbags, which each have a photo of a person demonstrating a different facial expression, such as happiness, sadness or anger. NAO asks the participant to find the toy with a certain expression and show it to NAO. Participants’ responses in the games are then analyzed, and researchers compare these interaction patterns with a control group. Right now, NAO is controlled remotely by a member of the research team, but eventually, Mahoor would like to have a fully automatic robot that could facilitate the game sessions. The platform has enabled the researchers to provide feedback and guidance to autistic children and their parents, and preliminary findings suggest NAO is helping some children maintain direct gaze for longer periods. At the 2014 International Meeting for Autism Research, Mahoor and his team presented some encouraging data: Children with autism spectrum disorders have more eye contact and less gaze shifting while NAO is speaking to them. But they noted these individuals still tend to shift their gaze more often and have less fixation on the robot when they are speaking. So far Mahoor and his colleagues have worked with 40 children over a span of about three years. While that’s not a large study sample, the fact that Mahoor is already seeing improvement in some participants – and hearing it firsthand from their parents – is exciting. “Once we have proven in the lab that this effective and feasible, then the ultimate goal is to do this on a larger scale,” Mahoor said. That would mean using humanoid robots as therapeutic tools for the broader autism population.